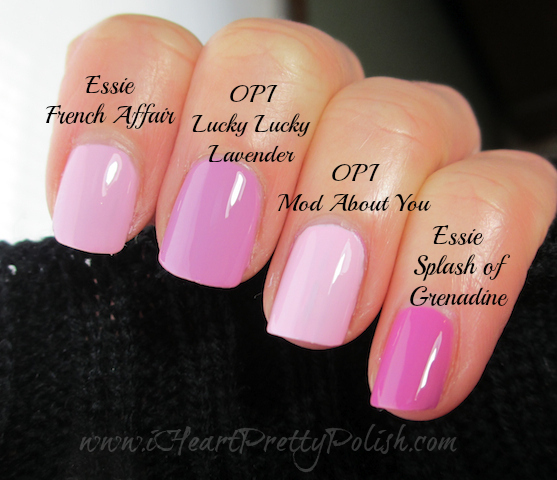 iHeartPrettyPolish: OPI Lucky Lucky Lavender and Lavender/Pink Comparisons No Dupe Here! Hi There! First of all, I want to remind you that we (Liesl and I) are having a $50 Gift Card giveaway and it ends in one day. Please click here to enter. Good luck! When I received Lucky Lucky Lavender and saw it in person, I thought that I probably had dupes in my collection. I love cool-tone pinks. The first polishes that came to mind were the ones below. And wouldn't you know, I don't have a dupe!? As you can see, French Affair and Mod About You are way lighter. I couldn't believe how white Lucky Lucky Lavender made Mod About You look. And Splash of Grenadine has more magenta pink in it. It's so weird how you can look at a bottle of polish and think that it looks so similar to others and when you compare them, they are so different. That's why I have so many bottles of nail polish - there are sooooo many different shades of the same color! Fun fun! 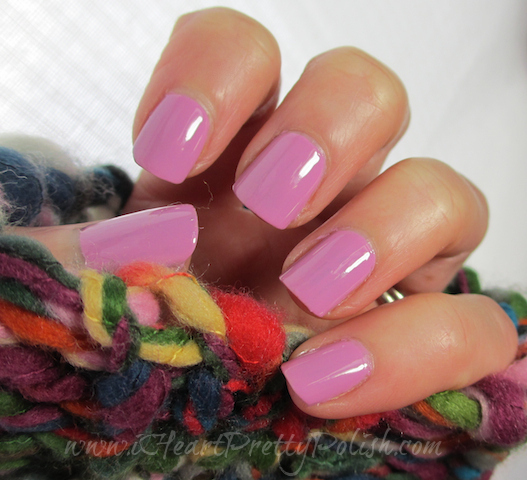 Can you think of any dupes for Lucky Lucky Lavender? I do have a few lavender/pinks that are close, but they have shimmer - OPI Pedal Faster Suzi is one of them. When you hold the bottles together, they are pretty similar, besides the finish. I'm happy with my swap - Thanks Amy! Ah, thank you so much:) I love them both too. I just love your nail shape. Oh you've got me! My favorite color is lavender and any color that is similar to it & i love all these colors! They look great with your skin color too. Thats why i love lavenders because they go with all skin colors. I'm stopping by from Bloglovin & I hope your having a great eveningg. I'm glad you like it! I love it too. Thanks for stopping by! LLL is stunning on ya, and from where I'm sitting, it does, in fact, look lavender...with a touch of pink :) Lool at "Wouldn't you know, I don't have a dupe!" Tee hee :) You've probs seen Molly Coddled (BL)... I haven't worn it yet but it's got that same pinky purpley thing going, I think :). So pretty! :) hehe. Yes, I have seen Molly Coddled. You picked that puppy up? Lucky you. Did you get it for the $9 sale?